Of all of Jesus’ parables this one is perhaps the most difficult to understand. A quick reading of this parable gives us the impression that Jesus is calling on his disciples to act more shrewdly even to the point of dishonesty! So, what is this parable about? It all seems so straight forward at first: A steward gets in trouble for “squandering” or mismanaging and is told he will be terminated. The steward, recognizing his complete unsuitability for physical labor comes up with a ruse to ingratiate his master’s debtors to himself. So he reduces the amount of the debts, collects the remainder of what is owed and earns the appreciation of the debtors. We expect that when the master finds out what he has done the steward will get punished in the end. But no, the master commends the shrewdness of the steward and Jesus finishes up by talking about the dangers of focusing life on wealth. To begin with we need to remind ourselves that Jesus’ parables in general are never straightforward. Jesus always turns the tables and what we expect to happen doesn’t happen. Unlikely heroes emerge, like the Good Samaritan; radical forgiveness is offered, like to the prodigal son; the good and righteous do not get the reward they expect, like the older brother or the rich man in the rich man and Lazarus; Grace and love of others takes precedence over self-righteousness and tradition, like in the unforgiving steward or the unjust judge. And I could go on. Suffice it to say, Jesus parables always have an element of shock and the shock is usually that God’s beloved human beings are more important than anything else, that God is about forgiveness and grace and love, and that this is also what the Kingdom of God is about! So bearing this in mind let’s then turn back to this parable and begin by making some general observations. First, we should not just assume that the master is God. In fact, the master is most decidedly not a stand in for God in this parable. This master is not the good guy in this story. He fires the steward at the beginning on the basis of hearsay. There is apparently no evidence. And the hearsay consists basically of the accusation that the steward is “squandering” (the same word that is used in the Prodigal Son parable) the master’s property, which means that the steward is accused of feathering his own nest at the expense of the master. And at the end he simply acknowledges that the steward has acted in a very shrewd and clever way, that does benefit him. Second, the context of this parable is immediately following the Prodigal Son, where relationship and forgiveness are more important than wealth and tradition and where the good and righteous older brother is left outside because he refuses to forgive. Then comes a series of sayings and parables about the idolatry of money. When the purpose of life becomes solely about the accumulation of wealth then that life has become hollow and purposeless and lots of people get hurt. Remember the issue is how are wealth and possessions pursued and used? If “greed is good” and life is focused on wealth and others (those without) are pushed aside and made scapegoats, their lives are destroyed because they are the “have-nots.” If the meaning of life means being a have – then you are not serving God, you have, in fact turned your back on God and have become a slave to the emptiness of the world. Third, the debt is extraordinary. “How much do you owe” asks the steward? “100 jugs of olive oil” comes the first answer – that is equivalent to 900 gallons of oil! 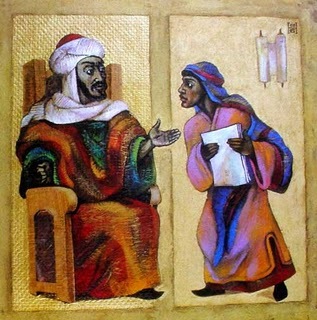 “And how much do you owe?” the steward asks the 2nd debtor. “100 containers of wheat” – that is equivalent to 150 bushels of wheat! Who can survive under the weight of that kind of debt? The debt will destroy the lives of the debtor, whether that debtor is an individual or (more likely) a community, like a village. By reducing this debt the steward has not only saved the debtor some money, but has reduced and eliminated a huge burden, and at the same time collected the debt and put his master in a good light. For, like it or not, once he learns of the actions of the steward, the master could not very easily renege on the bargain, especially since he has the payment in hand! When the master discovers the extent of what the steward has done the response is, “well played.” I don’t get the impression that the master is thrilled or pleased, but he acknowledges that what the steward has done has gotten him some benefits: renewed respect from the community, an enhanced position and a chunk of the debt in cash. The ploy has also provided the steward perhaps a reprieve on his firing (though we don’t know that) or at least strengthened relationships with the debtors in a way that would help him to re-establish himself. Well played, indeed! So what are we to take from this parable? Well, Jesus makes it clear that if we define our lives in terms of our wealth and possessions, if we are totally and completely focused on possessions and wealth then we have lost our way. This is certainly a timely lesson. Hearing this parable comes at a time in our history when a tiny percentage of people in this country possess more and more of the wealth, and there are more and more people who are in terrible need; large numbers of people who are homeless, hungry and suffering, through no fault of their own. At the same time there are more and more political moves to eliminate programs that help to house, feed and clothe those who are in need. Jesus is unambiguous here! We have a responsibility. People are more important than things and wealth. Those who worship wealth, those whose lives revolve around the accumulation of wealth have placed themselves outside the Kingdom of God. Another important lesson which comes through this parable is this: Relationships are important that anything else. And when in doubt, when we are struggling or in difficult situations the first thing we need to do is to establish, or re-establish or renew our relationships with others. For it is through our relationships with others that we experience God’s presence in our lives. A life that is filled only with things and no relationships will be an empty life indeed. Finally, this shrewd steward may not have been completely honest, but he had a vision for what was important in life and what he needed to do to accomplish this. And he kept his eye on that throughout the story and in the end he accomplished his goal – that is, the de-centralizing of wealth and possessions and the establishment of renewed relationships at the center of his life! I think there is a lesson here for us as well!